When I was approached by Miss Babs to contribute a design to her 2016 Knitting Tour, and given the Netherlands as my country of inspiration, I knew instantly where to look for ideas: the work of the Dutch graphic artist Maurits Cornelis Escher. I’ve loved M. C. Escher’s work for as long as I can remember; possibly for longer than I was aware of his name, as he is one of those artists whose work is so distinctly unique (so much so that Escheresque exists as an adjective to describe artistic works derivative of his own) that its presence is still felt in popular culture (see, for example, the end scene of the 1986 film Labyrinth, inspired by Escher’s Relativity); to the extent that, even if you’ve never heard of Escher, you would likely recognise one of his prints. Escher is known for his artistic explorations of mathematical concepts such as impossible objects, infinity, perspective, and hyperbolic geometry, which he executed in finely detailed wood-cuts, lithographs and mezzotints. I find Escher fascinating as an artist, and as a person, mainly because of his astonishing mathematical intuition (and his humble attitude towards it). He always played down his mathematical abilities, pointing out that he had never excelled in it as a subject at school, and had no love of algebra, yet somehow he frequently gravitated towards exploring mathematical subjects through visual means. (see this lecture from Oxford University for a fascinating look at Escher’s intuitive grasp of these subjects). “I think I have never yet done any work with the aim of symbolising a particular idea, but the fact that a symbol is sometimes discovered or remarked upon is valuable for me, because it makes it easier to accept the inexplicable nature of my hobbies, which constantly preoccupy me. 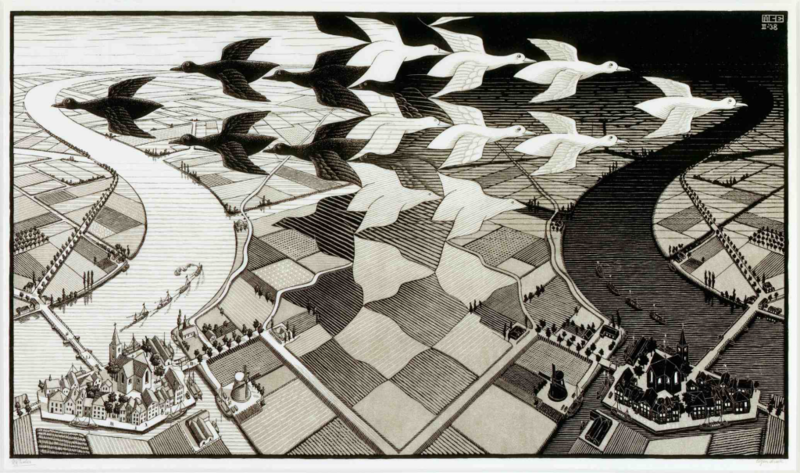 It’s worth noting that Escher specifies here ‘the regular division of the plane into congruent figures evoking an association in the observer with a familiar natural object‘, i.e. his obsession was not merely regular tessellation but involved finding tessellating shapes (‘jigsaw pieces’, as he referred to them sometimes) that evoked the shapes of familiar creatures or objects. Most often he played around with the shapes of birds, fish and reptiles, morphing in and out of negative space in increasingly complex ways, sometimes approaching infinity. The sort of repeating patterns that are used to decorate fabric are, by their very nature, tessellations; indeed, all knitting stitch patterns are tessellations! When I began designing Metamorphose, I knew that I wanted to evoke that gradual morphing of shapes, emerging from negative space and almost becoming recognisable objects. I stopped short of trying to evoke an actual recognisable object, due to the complexity of knitting that this would involve! As always, when designing I’m trying to strike a balance between something that matches the idea in my mind, and is yet still enjoyable to knit without being too complicated. In this case, I sketched a basic morphing tessellation based on a triangle shape; reverse stocking stitch and seed stitch provide an alternating pattern (like the black and whites in Escher’s prints). The cowl/infinity scarf is worked as a seamless tube, with the ends grafted together with a twist, to form a Mobius-like loop. I feel like Escher would have been quite intrigued by the potential of knitted fabric to explore concepts like Mobius loops, tessellation and infinity. The way that the tessellating shapes repeat around the tube is very satisfying (albeit, a little tricky – some beginning-of-round marker shifts are necessary at points where the cables cross from one round to the next). Delving into the world of Escher for inspiration for this design was great fun, and something I hope to return to in the future. I feel like there are a lot of possibilities for complex tessellating cable knitting, and I’d like to explore them. Thanks to Miss Babs for inviting me on her Knitting Tour (and for the beautiful Killington yarn that she dyed in a special colourway for this design – fittingly named ‘Escher’). Edited to add: if you’re interested in learning more about M. C. Escher, this documentary is a great starting point.